I love keeping my kids busy! Whether it’s kicking a ball, taking a walk, reading lots of books, or breaking out the arts and crafts, a busy kid is a behaved kid! One thing I especially enjoy is watching them create holiday crafts. It’s a great opportunity to talk to them about the meaning behind the holiday, and to celebrate it by being creative. With the Fourth of July right around the corner, you can start planning for this patriotic holiday by gathering all things red, white, and blue, and allowing your children to not just show their pride, but the chance to express themselves as well through art. Sticky and sparkly? Sounds like a child’s dream craft. Check out Busy Mommy Media for step by step directions (with images) that tell you how to set up and make this firework art activity. Gather some glue, salt, paper, water colors, and brushes and let them get patriotic! Take your toddler’s hands and outline them in glue three times. Fill in the outline with glue and have them sprinkle red, white, and blue glitter on each one before the glue starts to dry. Let it sit for several hours before shaking off the excess, revealing and capturing your little one’s sparkling prints. Obtain red, white, and blue cupcake liners and have your kids layer them on a large piece of white construction paper so they look like exploding fireworks. Check out one of my favorite blogs, Kindergarten Connection, for a full visual! I love this idea via Mothering With Creativity! Paint your child’s palm blue and alternate red and white on their fingers. Press their print down on white paper and wait for it to dry before adding white star stickers to the upper left portion. Have your child glue a popsicle stick to the left side of the print, making it look like a flag pole. Allow them to write their name and be sure to date the American masterpiece. On a warm day leading up to the Fourth of July, roll out a long white paper on your sidewalk or driveway. Pre-moisten water color paint for your toddler and younger children. Allow them to dip their paintbrush in the wet paint and fling the colors onto the canvas, making it look like exploding fireworks. Once the mural dries, you can hang up the artwork at your festive gathering or just to have a piece of art that commemorates the special holiday. Teach Preschool has some awesome ideas for kid friendly crafts, especially for the Fourth of July. Cut out red, white, and blue stars and stripes, and allow your kids to paste them on miniature rectangles to mimic flags. Let them explore with the shapes and lines with glue and toss a few crayons into the mix to add their own personal touches to their work. This patriotic bald eagle from Glued to My Crafts is one of my kids' favorites—simple, cute, and doesn't make a huge mess! (Via I Heart Arts N Crafts). I helped my son create a popsicle stick American flag that he could bring with him to the local parade we usually go to on Independence Day. I got the idea off a site called A Pumpkin and a Princess. The project required me to gather red, white, and blue paint, popsicle sticks, tape, cardstock, glue, rhinestones, and other little embellishments. All steps were easy to follow and the end product was just too cute! Danielle’s Place has lots of Fourth of July crafts to make, but the Patriotic Cup Catcher is my favorite! It looks adorable hanging outside the week of the Fourth. And, it’s cheap and easy to make, so your kids can even make multiples to gift to family members. If you need something festive to hang on your door, have your kids make a Fourth of July wreath. Craft Direct outlines how you can paint clothespins and help your kids position them around a wreath ring. Add a few stars, and you’re good to go! Do you take your children to attend the local Fourth of July parade? If so, consider having them make a wand this year to wave around! Eighteen 25 is a blog that I love because it outlines all the directions and provides visuals for each step, which is helpful if older children are constructing the craft on their own. Simply gather wood dowels, ribbon, and screw eyes, and you’ll have something fun and festive to wave around. Uncle Sam is widely recognized, so why not teach your child the significance behind this national figure? 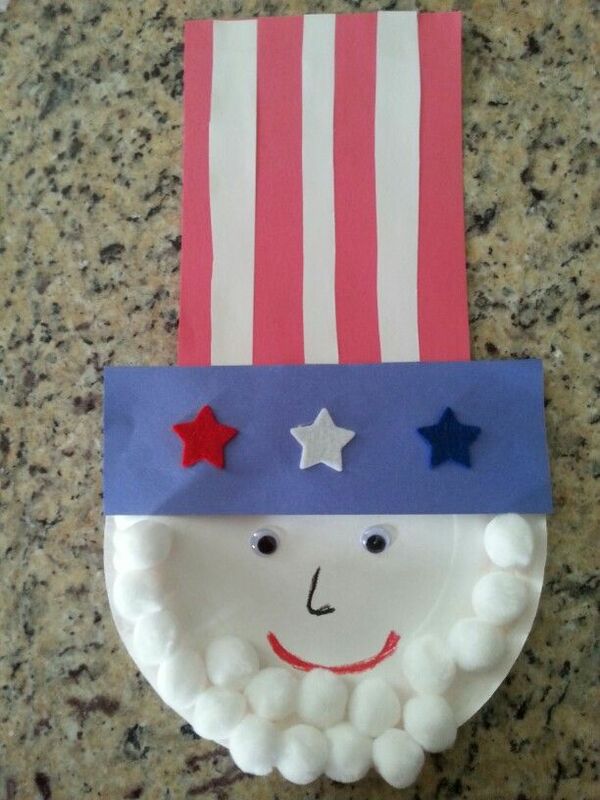 Then, have them create an Uncle Sam figure using a paper plate, for his face and some cotton balls for his beard. A visual I found on Pinterest helped me assist my child in the design. Top him off with a red and white striped hat, and add some foam stars in as well! Play Dough and Popsicles has a really cute craft called Star Spangled Banner Buddy. All you need is a styrofoam cup, construction paper, and some other craft odds and ends like google eyes, glue, and foam sticky shapes. The buddy can sit on countertops or porch stoops! Want this holiday to go out with a bang? Have your kids create noise makers. Kori At Home’s blog has some pretty amazing craft ideas for this holiday. But one that I really like is the Fourth of July noise maker via School Time Snippets! Kids often want to set off fireworks, but it simply isn’t safe. This craft keeps kids busy during the construction process, but is super safe to function when the real fireworks are exploding. Your kids will love creating faux fireworks using a marble! ​It contains cardboard, paper, paint, and marble—tons of fun! A Little Pinch of Perfect boasts a craft that my kiddos adore. All you need to do is gather red and blue tissue paper, card stock, clear contact paper, white paper, a ruler, a pen, and white paper stars. Follow the directions on the blog to create something that is festive and that can be hung on any window, days leading up to the holiday. This activity is great for older children who can read and write independently. Paint a few coats of black chalkboard paint on a large piece of cardboard or wood. Once it dries, give kids a piece of red, white, and blue chalk so they can inscribe the Pledge of Allegiance on it. Place it on your porch next to your flag, or hang it in a high traffic area of your home! My son wasn’t super into making Fourth of July bracelets, but my daughter was. We gathered red, white and blue beads, as well as pipe cleaners. We followed the directions on Playdough to Plato’s website, and as a result, she was left with an arm full of beaded bracelets! Heart of Deborah has the cutest craft ideas using chalk, which also double as amazing picture backdrops. Have the kids lay down on your driveway, and sketch out a torch and crown, so they look like the Statue of Liberty. You can also make it look like they are wearing Uncle Sam’s hat and surround them with stars and stripes. Regardless of what you draw with chalk, the kids will love being a part of the “scene” and you have one Instagram worthy shot! Ava’s Alphabet boasts an adorable hand print firework that can be made each year and framed for a personalized holiday decoration (or gift). Simply paint your child’s hand red or blue, and press it on a piece of white, sturdy cardstock. Once it dries, draw lines coming outward from the print and voila! You're done. Your kids will love getting their hands painted and will enjoy seeing it framed and hung afterward. The Fourth of July is a special holiday for my family. It’s great to spread the love and pride to your children. They’ll love completing these 20 crafts and will get into the holiday spirit by doing each one. Whether you choose one or all, your child’s imagination, creativity, and passion for their country will be evoked and engaged!